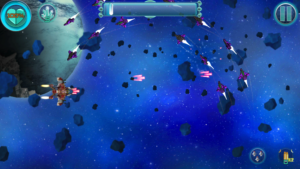 Wardog Shooter: Space Attack is a new space shooter game with RPG Elements. There are two game modes available you can play in this game. ⇒Space shooting mode in which you fight with aircraft against enemies and your goal is to defeat the last aircraft at the end of the lane. ⇒ Another game mode is like a platformer shooting game in which you shoot down enemies with your weapons. Both game modes are very difficult because enemies have more power than yours. Graphics of this game are great, but the gameplay is dull because of less responsive controls. 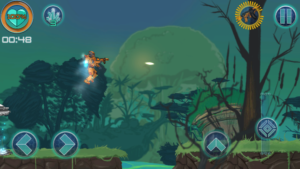 In space shooting mode, you just tap and swipe to shoot down other aircrafts. But you can not see your aircraft on the screen because it hides below of your finger. While in platform shooting mode, everything is fine, but the gameplay is not so great. 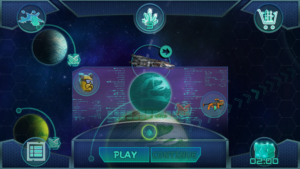 Shotgun, laser gun, rocket, plasma howitzer, acid solvent, resonator, atomic cannon, deafening grenades and other are present in Wardog Shooter: Space Attack. You may get these weapons by breaking wooden boxes. Wardog Shooter: Space Attack comes with many unique levels, beautiful landscapes, and bosses. Variety of enemies are featured to fight against. What you have to is rescue the scientists by investing various planets. Game Modes, Graphics, And Story are great but the gameplay is a little bit boring. You can play this game offline. If you are interested, you can get it here.